CINTURATO™ ALL SEASON is the ideal choice for owners of small to medium cars who use their vehicle daily, on short journeys and in gentle driving conditions. 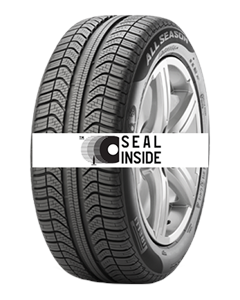 Its the only aftermarket all-season tyre with Seal Inside™ technology which seals iteself if punctured. This latest product enhances Pirelli's line-up by offfering a tyre that works equally well throughout the year. A special sealant within the tyre forms a seal that wraps around the foreign object (up to 4mm in diameter) and prevents air from escaping. When the object is removed the sealant also plugs the gap guaranteeing proper pressure for the life of the tyre. High performance under braking and in corners thanks to the optimised movement of the tread blocks. On snowy surfaces the tread blocks open up to capture snow and provide excellent road holding. Increased safety in the wet, optimising water expulsion thanks to the directional tread design and the two wide longitudinal and lateral channels, reducing the risk of aquaplaning. Enhanced acoustic comfort thanks to its innovative design. Niose has also been reduced, both on the outside of the car ) in accordance with increasingly stringent European noise legislation) and also on the inside of the car, enhancing driving enjoyment. All weather performance thanks to Full Silica Technology that is able to work at its best throughout a wide range of temperatures and weather conditions. Didn't end up buying a car here but couldn't fault the staff. The salesperson who dealt with me sat for a while and went through various options and I didn't feel pressurised. I'd feel comfortable recommending them based on my experience.